The state is predicted to see an 84% increase in its commercial salmon harvest this year by number of fish, according to the annual forecast from the Alaska Department of Fish and Game. The agency projects a harvest of about 213 million salmon, compared to the 2018 harvest of about 116 million. Fishing starts in May. Last year was a difficult one for some Alaska commercial salmon fisheries. It’s not out of the ordinary for a harvest to oscillate so much from one year to the next, said McDowell Group economist Garrett Evridge. Even by 84%. Fish and Game’s forecast calls for 97 million more pink salmon than last year, and 8.7 million more chum salmon. The sockeye harvest is expected to drop by nearly 9 million fish from last year, when Bristol Bay boomed and other regions had dismal returns. If the agency’s projection pans out, the chum harvest would be the largest on record for Alaska. There’s a “great deal of uncertainty” in predicting pink salmon numbers, Fish and Game noted in its forecast. There’s optimism around the expectation for a strong pink harvest this year, said Evridge. The harvest of 138 million pinks projected by the state would be broadly in line with previous odd-numbered years even though it would mark a big increase from about 41 million in 2018. The 2019 Alaska sockeye harvest forecast of 42 million fish, though projected to be lower than last year’s catch, is in line with historical norms, said Evridge. Though many sockeye fisheries in Alaska suffered poor numbers in 2018, Bristol Bay’s run was so strong that it compensated for those areas in the state’s total sockeye tally. Excluding Bristol Bay, Alaska’s sockeye harvest in 2018 was about 40% lower than the 10-year average, Evridge said. This year, while Bristol Bay’s sockeye harvest is expected to go down to 26 million fish after a banner year with 42 million sockeyes, some other fisheries are expected to see a bigger sockeye harvest. The Chignik sockeye salmon fishery was devastatingly bad in 2018. It had the poorest sockeye return on record since statehood for the Chignik Management Area. That season was an “outlier in terms of historical harvests,” Evridge said. 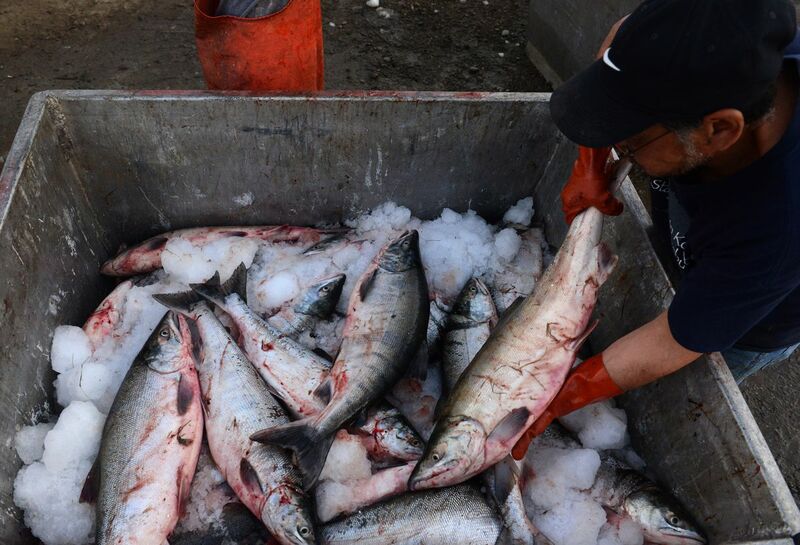 This year, 1 million sockeye salmon are expected to be harvested in that Chignik fishery, according to Fish and Game, and about 2.4 million pink salmon. Those numbers would represent a return to a more typical harvest. Last year was also a poor year for king salmon harvests statewide. This year is expected to show a slight increase from 2018, Evridge said.